Ahead of next week's season three premiere of Stan Against Evil on IFC, the cult hit dropped the a pre-season episode of its third season onto VOD platforms today -- and kicked off its best and zaniest season yet. 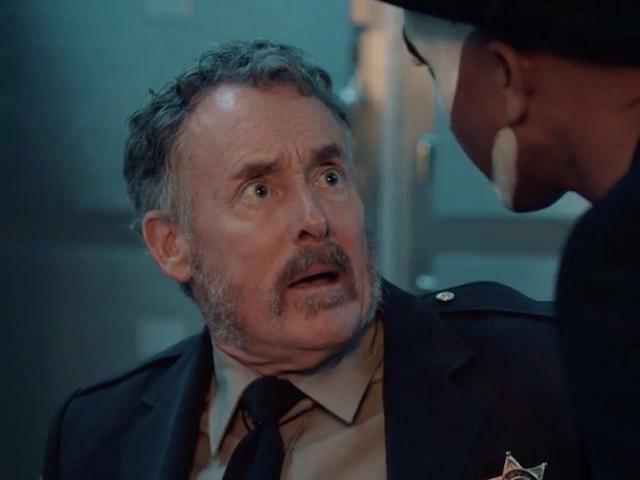 If you have not yet seen Stan Against Evil, imagine if Wynonna Earp and Evil Dead had a baby -- but that baby was a middle-aged misanthrope played to perfection by John C. McGinley. McGinley plays the ex-sheriff of a small town, where every constable or sheriff for centuries has met an untimely and usually gruesome demise. Turns out there's a curse, put on law enforcement in Willard's Mill after citizens were unfairly burned at the stake for witchcraft -- and Stan only lasted as long as he did because while he was acting as sheriff, his late wife was secretly banishing occult threats to his life and the community. The show follows Stan and his successor, Evie Barret, as they try to cobble together layman's solutions to the problems his occult-expert wife had tackled during her lifetime. The new season picks up immediately after the events of the Season 2 finale, with Stan and Evie back in Willard’s Mill dealing with the consequences of Stan traveling through time to save his dead wife Claire. In doing so, he inadvertently opened a portal between the Land of the Living and the Land of the Dead…allowing evil forces to truly take over the town and even some of its inhabitants. Although always the skeptic at first, Stan must work with Evie to once more save the town – even if it means making a literal deal with the devil. McGinley is a national treasure, as he has established over decades of work, but each season his chemistry has improved with Janet Varney and Deborah Baker Jr. Each of those actresses plays a radically different character, meaning that even though there are only a small handful of characters in any given episode of the show, there are usually a handful of fun interactions as new characters and threats work their way through the impatient discontent that is Stan; the high-strung and exasperated Evie; and Denise, who is arguably the most recognizably IFC-style character on the show. Since its first season, Stan Against Evil has been criminally underrated and under-discussed; this season, the show feels like it has gone to the next level, fine-tuning its madcap identity into something that is a leaner, smarter version of itself. Hell is What You Make It: Stan Against Evil returns, and almost immediately dispatches with the world-breaking twist of the season finale. The way it is done leaves a little to be desired in terms of big-picture narrative storytelling, but it is difficult to fault Stan for this, since at the end of the day it is a horror-comedy, and there are very few opportunities for comedy in a world that is essentially at an end, overrun by monsters and offering no respite. The episode introduces a couple of interesting new concepts and characters, and features a truly great performance by Janet Varney, whose earnestness in the face of the absurd is underscored by scenes where she gets to play off Nate Mooney, whose every scene on this show is hilarious. The low-budget horror of the show is never more evident than in this episode, where much of the episode centers on a monster that is very clearly a stunt performer in a rubber suit -- but it is entirely forgivable, because the episode (and the season as a whole) fully embraces that aesthetic, using it to comedic advantage in several places. Note: per Twitter, that is not a stunt performer in the costume but Mick Ignis! The Hex Files: This episode, a parody of The X-Files (as the title suggests), feels like one of the best of Psych's theme episodes in the best possible way. The story introduces a pair of state agents who have an all-too-familiar dynamic, and is so much more entertaining than almost anything The X-Files actually did in their last two seasons that it reminds the viewer how difficult it is to play something straight once it has become so much a part of the popular consciousness that really effective satires like this exist. The episode's dialogue is full of knowing winks and nods to the show's history as well as The X-Files -- and, yes, a cameo by a truly '90s cell phone. Guest star Valerie Tosi deserves special credit for this one, as she perfectly nails the tone of Gillian Anderson's performance as Special Agent Dana Scully, but does so without feeling like someone who is trying to ape The X-Files. Baker Jr deserves some kudos here too, with one of her best exchanges with Varney yet in the series. Maybe the funniest Stan episode yet in terms of just set-'em-up and 'knock-em-down jokes, The Hex Files sets the tone for the rest of the season really effectively. Larva My Life: Another "theme" episode, this is Stan's "kaiju" episode, as Evie's ex-husband Kenny is transformed into a giant moth and has to fight the most improbable foe of the series so far to a standstill. The attention to detail in the episode makes it a treasure -- including a pair of identical twins played by Vera and Barbara Ann Duffy whose lines were recorded, removed, and then added back in with ADR so that they just barely don't match the way the women's lips are moving, lending a sense of those old, badly-dubbed Godzilla movies to the episode. David Koechner (Anchorman, The Office) has been playing the same guy-you-love-to-hate for so long that it feels like at some point it starts to bring diminishing returns, but it is difficult to say whether the role of Kenny would be better or worse with someone else playing it since it was so clearly written to Koechner's individual strengths. Along with the premiere, this episode really cements the wild abandon of the season, with a final monster battle that is maybe the funniest thing you will see on TV this year. Stan Against Evil will debut on IFC on October 31 at 10 p.m., with two back-to-back episodes. You can see the first three episodes of the new season now on VOD, the IFC app and digital pages, and YouTube.